Our reviewer for the single entry received for our July-August Challenge was Susan Toy – a bookseller, an award-winning publishing sales representative, a literacy teacher, and a promoter of fellow authors and their books through her company, Alberta Books Canada. 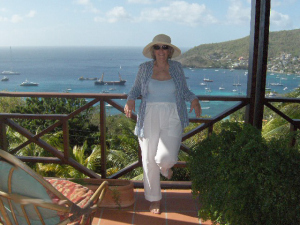 Susan is also an author and publisher, her imprints are IslandCatEditions and IslandShorts. Through Alberta Books Canada, Susan represented authors directly, helping them find promotion for themselves and their books, seeking out new readers, and assisting them in making wise career decisions. Susan continues to promote authors and good books in general, throughout the world and online, on her blog, Reading Recommendations. She created the writing contest, Coffee Shop Author, has sat on the Board of Directors of the Fernie Writers’ Conference, served as a member of the Calgary Distinguished Writers Program steering committee, and was a member of the board of directors for the Writers’ Guild of Alberta. She is now concentrating on her own writing and publishing and divides her time between Canada and her home in the Caribbean. In the summer of 1975, I was working for a small instrument company in Waringstown, Co. Down, assigned to sort out a problem at a water treatment plant in bandit country. Bandit country was anywhere in South Armagh where the IRA had a strong and active presence. This plant was situated in an idyllic setting high up in the Mountains of Mourn and not far from Newry. The highlight of this particular job was spending lunch hours fly-fishing in the lough not far from the plant. The weather was fine and sunny, the trout were rising in their thousands all over the lake, but none seemed hungry, at least, not for my fly. So I caught nothing, but then, fishing isn’t necessarily about catching fish–or so I tell myself. The lowlight occurred during a trip to Newry. I had decided to replace a motor in the plant and drove to a supplier in the town. The motor wasn’t very big, but it was fairly heavy, so I sort of bundled myself backwards out of the shop door carrying this heavy motor in my arms, almost colliding with a passing soldier. Now this was not any old soldier. He was in full patrol mode, rifle unslung – locked and loaded no doubt (as the Americans would say), and more significantly, he wore a red beret with a Pegasus badge. Oops! Bumping into a member of the Parachute Regiment is not a good idea at any time, but in the middle of bandit country . . . not good. He wasn’t a dwarf, so he wasn’t Happy. In fact he was rather tall, dark, and carried the sort of features that wouldn’t shrink from jumping out of a planeat ten thousand feet with just a scrap of silk between him and oblivion. He glared at me with obvious disdain, and despite my English accent, he either took me for a bandit, a collaborator, or both, because he proceeded to give me the third degree:“Who are you?What are you doing?Where are you going?”He growled. Only a few short years before, I would have outranked him both in terms of seniority and rank. But now I had long hair and a beard . . . and he had a gun. Besides, I don’t think he would have taken too kindly if I had come out with the old ‘name, rank and number’ routine, so I didn’t try. It did make me think however, that if they treat every innocent person like this, its little wonder that so many in the area supported the IRA and despised the Para’s. On the other hand, every patrol around this area meant he never knew whether this would be the one when he’d be shot at and killed or wounded, as had been the case with so many of his comrades. Commuting to and from the plant meant travelling through Lurgan. Along the main street I had noticed a boat laid upright against a wall with a for sale sign. £45 it said, complete with an outboard motor. It was about ten feet long and quite wide in the beam, with buoyancy tanks down either side. The hull was painted a bright British racing green and white on the inside. Over the course of a few nights, I considered the idea, and eventually thought it would be good for a bit of off-shore fishing. So, of course I bought it. I didn’t own a trailer and since I was young and already stupid, I reckoned I would lash it to the roof rack. Bearing in mind I was driving one of the old Czech Skodas, the boat was probably bigger than the car. But, as I said – young and stupid. The boat was a great hit, though, and once Dad acquired a trailer, he and the boat spent many pleasurable hours fishing off Port Muck on the Islandmagee. I was away from home much of the time so I look back with regret that I missed most of those fishing trips. Before I get to the main story, two other boating incidents come to mind. On a nice sunny day I decided to go for a sail on my own. I hitched up the trailer, drove down to Whitehead and launched the boat from the ramp there. The engine came off the Ark, but was still very reliable and invariably started on the first pull of the rope – and so it did this day – which was a shame, because I’d forgotten to loop the ballast bag over the bow. (The boat was so buoyant that without putting ten kilos of lead in the front, the bow would rise up under power. This lead was kept in a haversack, and we looped the strap over the bow post). Still young and still stupid, I thought I could easily fix the bag without shutting the engine down. Well . . . The engine was ticking over at minimum revs when I let go of the tiller. I managed to reach as far as the middle of the boat before the engine flopped over on full lock to the left, which meant the propeller was pushing the boat anti-clockwise. It began to spin in a tight circle. In fact, within a split second, the boat was spinning on its own axis so that I almost fell overboard. Instead, I ended up sprawled in the bottom. It was like being in a washing machine; the boat was spinning so fast that I had to struggle to stand, but in the end, I did manage to claw my way back to the engine. After two or three spectacular pirouettes, I had things back under control and half expected a round of applause from the audience around the little harbor. I cut the engine, fixed the ballast and nonchalantly went on my way, as though nothing had happened. The second incident came on another fine day. Dad and I set out from Port Muck and puttered the boat about half a mile from the harbor where we cut the engine and dropped the anchor (a pick-axe head on the end of a rope – nothing but the best for us!). We set up our rods and I was the first to drop my baited line into the water. Straight away I got a huge bite. The rod bent double and I fought to reel in this great fish it had to be size of a cod or haddock. Every now and then the line would go slack and I had to reel like mad to keep it taught before once again the fish turned and tried to escape. The fish was pulling so hard I had to set the drag on my reel, allowing the line to feed out slowly under extreme pressure to prevent breakage. For perhaps five minutes, Dad and I were both totally absorbed in fighting this fish. Every time I reeled it in a little, the fish would run and I would be forced to feed the line out again. Maybe it was the sound of breaking waves, or a sixth sense, I don’t know, but in the midst of all this action, I turned round – and there, not fifty metres behind us, were the soaring cliffs and jagged rocks of a little island just outside the harbor. I dropped the rod and made a lightning dash for the engine which started first time, once again, so we were able to motor away to safety. Another few seconds and we would have been served on the rocks without a drink. We had dropped anchor in what proved to be a rip tide. The fish I’d hooked was actually the hook itself catching and releasing on the bottom as the fast current rushed us toward the rocks. Looking out the front room window of our house in Ballycarry, you could see down the hill to the causeway across to Islandmagee and beyond those green fields to the Irish Sea; way off into the distance are the shores of Scotland. It was a popular joke in the village that if you could see Scotland, it was going to rain. If you couldn’t see Scotland, it was already raining. On a clear day you could just make out the cottages on the Scottish coast, like little white dots against a green field background, and I often wound the kids up by telling them I could see a little old man sitting in front of his cottage, smoking a pipe. They would then spend ages staring through binoculars trying to find him. Of course, a tiny dot, even at times-ten magnification, is still only a slightly less tiny dot, so if any of the kids are reading this now . . . I was lying! Since I am definitely a fair weather fisherman, this particular day must have started out fine, because Dad agreed that a day’s fishing was a good idea. But instead of going to our usual fishing ground off Port Muck, we decided to try the sea in Browns Bay for a change. Now, Browns Bay is a mile or so round the coast from Port Muck, so it made sense to use the ramp at Ballylumford, which was closer. In due course the boat was launched and we puttered our way round the headlands into Browns Bay. We spent perhaps an hour fishing, but nothing was biting so we packed up and moved past the next headland into Port Muck Bay. By the time we arrived there, the weather was changing. The sky had darkened as clouds rolled in, and the wind was stiffening. The sea, which had been calm and benign, was gradually becoming choppier and choppier. Without dropping a line we decided to call it a day and pointed the boat back to Ballylumford. The wind and waves were coming in from the north, but we had to sail northwest, directly across the incoming storm. As the sea got higher, we realized we couldn’t maintain this direction without being swamped or capsizing, so I steered directly into the wind and hoped we could turn and use it to still get past the headland. So I stubbornly maintained this direction for maybe an hour with the seas getting higher and higher. Eventually I realized we weren’t going get around the headland, but by then, the situation was at a point where the seas were so high, I couldn’t turn safely even though I wanted to, and all that was happening was we were being pushed out further and further from shore. The crew of a passing yacht shouted over and asked if we needed a tow, but since they were sailing at right angles to the wind, it would not have helped. Eventually a small patch of calm water appeared as though out of nowhere, but by the time I realized I could turn, it was too late and it had disappeared. Maybe five minutes later, I was ready when another, larger patch came up, and swung the tiller over. That plucky little boat turned on a sixpence and we were away. Despite taking an hour to travel half the distance into the wind, it took no more than five minutes to motor downwind and into Port Muck harbour. I left Dad minding the boat and spent the next half-hour or so ‘yomping’ across hill and dale, through hedges, and over fences with a couple of kilos of sea boot on each leg. I retrieved the car and trailer, picked up Dad and the boat from Port Muck, and headed home for tea. Oh happy days!! The title of this story was the first that came to mind when I decided to write these memoirs. Not long afterwards, Dad bought a bigger boat with a bigger engine and most importantly . . . some life jackets!